The St. Ignatius Dance Program offers opportunities for students through dance instruction and performance in three different areas: Dance IA, Dance IB, and Dance Workshop. In Dance IA and IB students learn the “vocabulary” of dance – positions, terminology for steps, combinations and develop vital elements of dance including balance, posture, gesture, rhythm, space and breath. The class helps the student to discover new ways of moving and to communicate one’s artistic vision through dance. Admitted by audition only, Dance Workshop offers dance as an academic performing art. Students will learn to further build technique, personal expression and work in a dance ensemble to gain choreographic experience as an individual by taking risks in creating new styles and ways of moving. Dance Workshop performs in the Fine Arts Assembly and Dance Concert. Click here if you wish to download at no cost current dance photos. Students interested in studying dance at St. Ignatius have many opportunities. As part of their academic school day, they may enroll in Dance 1A and Dance 1B. Both are introductory level courses that fulfill the Fine Arts Requirement and one half of the Physical Education requirements for graduation. Dancers with previous experience who are interested in more intense study and performance opportunities should audition for DANCE WORKSHOP. Dance Workshop is an 8th period (after school) class that meets 1-2 days a week to study various styles of dance, learn choreography, and perform in the annual Dance Concert in January, Fine Arts Assembly, and some school liturgies. Auditions are held in May for returning students and in late August for new students. Audition information is distributed via student email and Parent Newsletters. Contact Ms. Meredith Galvin with questions. Type of Course - Elective satisfying one semester toward Fine Arts graduation req. Course Description - This course introduces beginning technique, warm-up exercises, in-class choreography, movement in space, and improvisation. Students will study ballet, jazz, and social dance forms including Charleston, swing, and hip hop. As a final project, students will create a dance in small groups and will research the history of a style of dance. Course Description - Building off the foundation of Dance 1A, modern dance movements and form are presented. The class will trace the history of 20th century modern dance through the present using both the history and the movement of major choreographers such as Isadora Duncan, Martha Graham, and Alvin Ailey. With that history as their foundation, students will experience the choreographic process themselves. Using various creative stimuli, the dancer/choreographers will create new dances both individually and in small groups. NOTE: Dance 1A OR Dance 1B will also fulfill the second semester of the Physical Education requirement for graduation. Type of Course - Elective satisfying one semester of Fine Arts graduation requirements. Criteria - Admission is by audition only. 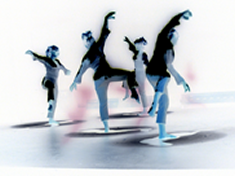 Course Description - This course is designed for students with previous dance experience. Emphasis will be on building techniques necessary for presentation and performance of ballet, jazz, and modern dance styles. Students will present a final project of dances at the Dance Concerts in December and/or March.